The title of this episode, The Vision, refers to something that happened near the end of the hour, but I’m going to ignore that event because of spoilers. I’ll only note that my favorite part was the waterspout and the breathtaking final scene. Much of the rest of the episode, similar to last week, was Set Up for conflicts to come: between Bjorn and Rollo or possibly Bjorn and Harald Finehair (who has AMBITIONS); between Ragnar and King Ecbert; and between Lagertha and Aslaug. This episode also gave us more insight into Ivar the Boneless (Alex Høgh Andersen) who was one of the most famous sons of Ragnar. That certainly implies that he cannot walk so has to be carried. The saga also describes him as the cleverest of the sons of Ragnar and Aslaug, and therefore the leader of the brothers who, in the saga, get along remarkably well with each other. In this series though they are not quite so chummy – at least, not with Ivar – and frankly, I think that Hirst’s characterisation of the brothers is probably more realistic. 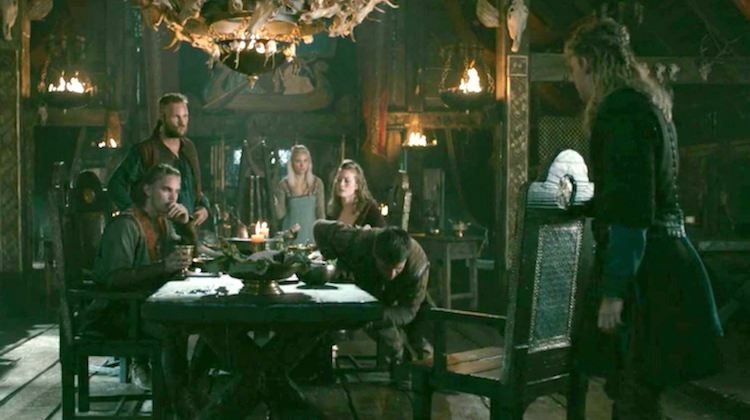 There is a scene in this episode that is like The Dinner From Hell, filled with tension, resentment, jealousy and cruel taunts – directed at Ivar. 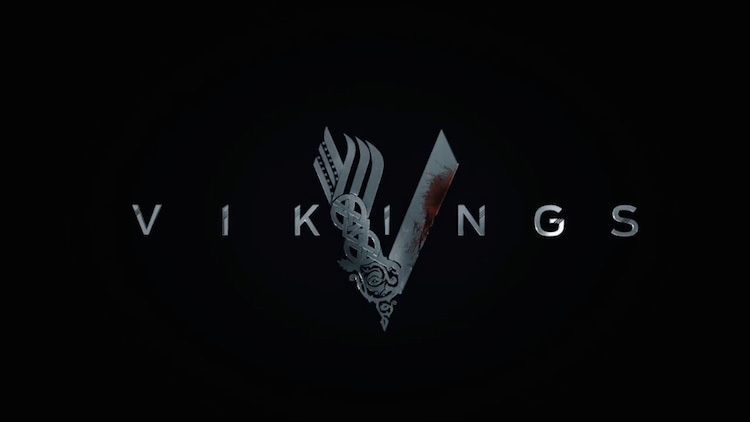 The youngest brother, Sigurd (David Lindström), suggests that Ivar should have been left to the wolves as an infant (which tells us that Ivar knows the history of his birth), and the eldest brother, Ubbe (Jordan Patrick Smith), later admits that Ivar terrifies him. Well, what else can you expect from the sons of Ragnar, whose relationship with his own brother was so fraught with rivalry and resentment? Hirst has carefully grounded this family dissonance in the character of Ivar himself which, although as twisted as his body, is perfectly understandable. He was born, deformed, into a family of strong, healthy, ambitious sons. Sibling rivalry is taken to extremes with these guys, because they all want to outdo their father in fame. For example, when Bjorn (Alexander Ludwig) sets out on a long, dangerous voyage, his woman Thyra (Georgia Hirst), tells him to stay safe, but warns him not to come back unless he does something extraordinary. No pressure, Bjorn. So Ivar, the runt of the litter, resents his brothers for their health, their strong bodies, and their skill with weapons and with women, and is determined to outdo them any way he can. Although his mother clearly favours him, he perceives it as pity, and at the same time that he hates her pity, he has all his life taken advantage of the license it grants him. Meantime, he hides his own fears about his inadequacy behind cruelty, bullying and a ferocious anger. And now he has joined Ragnar for an adventure to Wessex, both of them crippled in more ways than one. Some historical trivia to note: there was a scene in which Ragnar seemed to go manic and fling gold at the men of Kattegat. It was a bizarre corruption of the image of the lord as gold giver and ring giver, who rewarded men for bravery and loyalty. Ragnar wasn’t rewarding them, but bribing them to sail with him – and they were, as Ivar described them – the dregs. 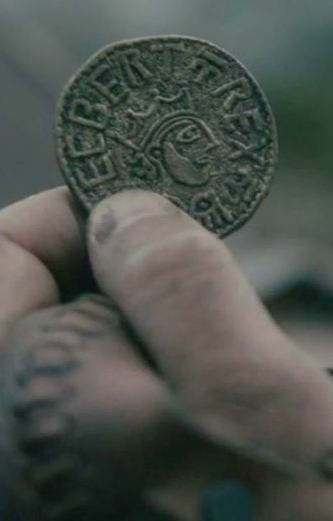 And speaking of Ecbert, remember the gold coin that Ivar held up and asked to keep? That was a mancus, and we find references to these gold coins in charters and wills. No mancus has ever been found with Ecbert’s image on it, which does not mean that there weren’t any; gold tended to get melted down. I question the crown on Ecbert’s image, though. These coins were modelled after Roman coins, and the heads of the emperors were crowned with wreaths, so the images of the Anglo-Saxon kings had wreaths and, later, helmets. A gold mancus of the Mercian King Coenwulf (796-821) was found in 2001 near the River Ivel in Biggleswade (yes! There is a town in England named Biggleswade!) about 45 miles north of London, in 2001. Coenwulf, you’ll see, has no crown. 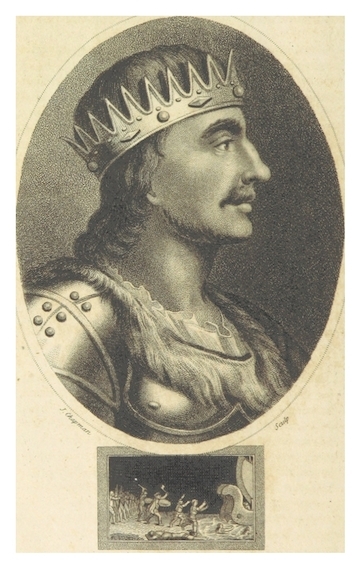 But a 19th century drawing of King-Ecbert-with-a-crown looks a lot like the coin created for Vikings. And let’s face it, Ecbert the Awesome, given his ambitions and colossal ego, would probably have insisted on a crown. Vikings is currently airing on The History Channel in the U.S. and streaming via Amazon Instant Video in the U.K.
Patricia Bracewell is the author of the Emma of Normandy Trilogy. The latest, The Price of Blood is out now. She blogs about historical drama on her website and will be covering Vikings for Historia. Keep in touch on social media for the latest reviews.